Finally back at Westfork Ranch after a couple hundred miles of traveling which started out painting on the way down to Hood River and the best plein air paintout in the NW at the Columbia Art Center. 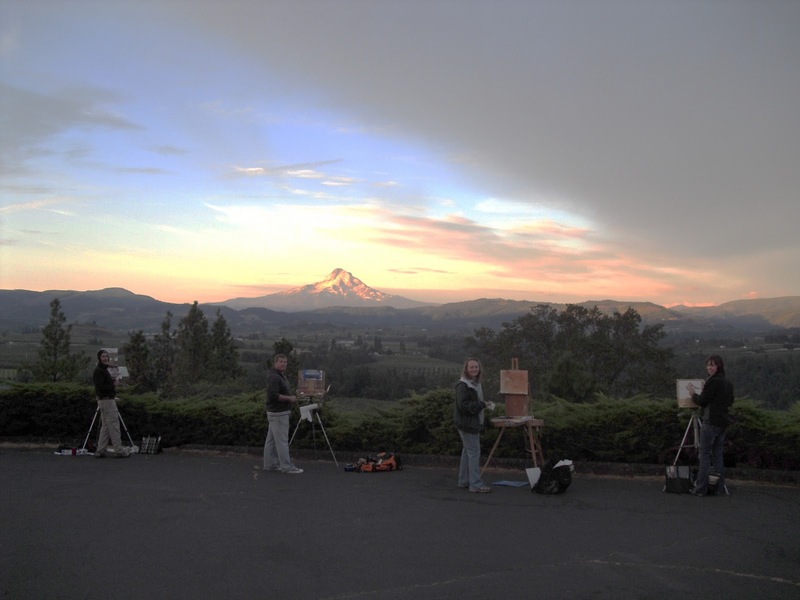 About 40 of the most prominent plein air painters of the NW gathered for a week of painting in and around Hood River, Oregon. What an extraordinary place. 10 minutes west and you are in a green rain forest of waterfalls. 10 minutes east and you are in the desert. World class windsurfers fly across the Columbia river in kites, parasails and boards and if that isn't enough Mt. Hood is only an hour away as well as Mt. Adams in Washington. The folks at Columbia Art Center really know how to put on a show. Artists are hosted by area patrons. Maps are provided and a number of receptions are held. Sales are great and the comaraderie is even better. Thanks everyone. Look forward to seeing you all next year. As I was painting in Hood River, I came around the corner of a building where we were all painting to find Elio Camacho set up and painting. I had never met or heard of this artist. To say I was delighted to see him paint would be an understatement. Rather, I had an epiphany. Here was a guy painting BIG. Big easel, big canvas and big paint! I sat mesmerized as I watched his technique. He's a shy guy around people he doesn't know but a very warm and friendly person once he gets to know you. I was so inspired I gave myself permission to 'do my thing' which is to paint big. I drove to Portland and picked up some 24x24 canvases, the size I have been painting on at home. It turns out I 'dumb down' my work and paint small at paint outs. It's not good for me as I don't do well on 11x14. Guess these old eyes and being 6'3" I need to paint big. The next two days I did 3, 24x24's and was 'back in the groove' and enjoying myself. My pieces really stood out in the show and one found a home with a delighted collector. On the spur of the moment I decided to attend Camacho's workshop in SW Oregon near the California border. It's a big deal for me to expose myself to the influence of other's work but I've been looking for an artist to paint with that I appreciated their work. I considered attending a Ovanes Berberian workshop but kept putting it off for years as I didn't want to get out of the groove I've been in. Turns out the Camacho is a student of Berberian and quotes him a lot as well as Berberians mentor Sergie Bohngart, an artist my mentor, William F. Reese, held in high regard. I've never spent much time at the ocean. I'm a desert rat in that the first time I saw the ocean I was 18 and from Montana. It's a little bit like the Big Sky Country but doesn't stop moving. It was something like being on an alien planet. It was good weather and beautiful and I did some good painting but they are workshop paintings trying to work out the things Camacho pointed out needed work. There isn't a painting that doesn't need improvement so I did a lot of scraping and still came home with 6, 24's that I'll keep as reminders of what I need to work on. Elio is a generous and knowledgeable teacher and very accessible. 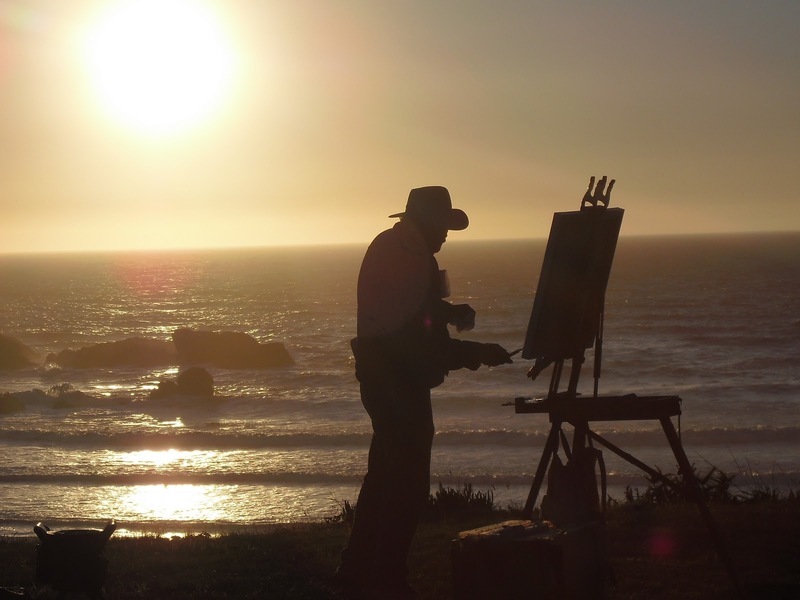 His best teaching is done with the brush as he usually has a painting going. 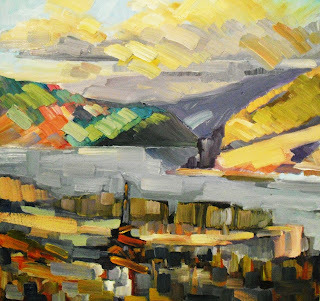 His technique and color use is exceptional. Check out his work at http://www.eliocamacho.com/ .